Fans have played a huge role in Lucy Rose's career. After she parted ways with her record label in 2016, supporters in Latin America organised an intimate, two-month tour, which helped her rediscover her passion for music. The trip became a documentary - and one fan's response to that film changed Lucy's outlook on life. It began when Zoe Schofield, who has Asperger's syndrome and chronic fatigue, which leads to chronic pain, saw Lucy's show in Bristol last July. "I was showing the documentary," the singer explains, "and after the show I had an email in my inbox, just before I went to bed, from a guy called Dave who turns out to be Zoe's dad. And actually the documentary had made her feel quite upset. "He was like, 'I was so surprised by it - but she has disabilities, chronic pain, and this video made her think about all the things she wanted to do in her life and that she feels like she can't.'" The email left a huge impression on 29-year-old Rose. Lucy had never considered her overwhelmingly positive experiences in Ecuador, Peru and Brazil could have a negative impact on someone else. "It was just so intense," she recalls. "In my naivety I hadn't thought that could be a difficult watch for people in different situations." When she returned to Bristol last November, Zoe was back in the audience. After a chat at the merchandise stall, Lucy resolved to do something. "I said, 'Let's make a music video. I know the documentary made you feel this way - and I'd love to make a music video with you that makes you feel the complete opposite.'" Zoe reacted with a "mix of disbelief, excitement, and mild terror". "It's not something I would ever have expected her to say," she tells the BBC via email, "and my ASD [Autistic Spectrum Disorder] and anxiety makes everything outside of my comfort zone daunting. "Then I thought about how excited I would be if I saw someone with my disabilities in a music video: Someone like me, with all those struggles, out there being visible and living life anyway. "The idea of being able to make that happen, to embrace my disabilities and go do something amazing anyway - it was still terrifying, but it was really exciting too." Lucy put the entire project in Zoe's hands. 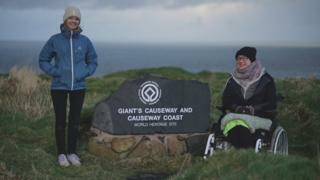 The teenager listened to Lucy's song Strangest of Ways and, inspired by the lyric "Let me live in the wild tonight", booked a trip to the Giant's Causeway in Northern Ireland. They flew out earlier this year and spent a day shooting the video in the bitter cold of Ulster's northern coast. "I have so many great memories of shooting the video," says Zoe. "But my favourite was near the end of the shoot. "After we'd been down to the causeway (and I'd had a rest) we decided to go up to the headland that overlooked it. "There was this perfect moment where the sun burst out from behind the clouds and a rainbow formed on the horizon over the sea. "Even thinking of it now when I'm at home and exhausted and aching - it fills me with this overwhelming sense of awe and pure joy that I felt then, that feeling of connection to the world, to the wildness in my soul, of being alive. "Sharing that moment with this little group of really great people, and knowing I was a part of something - moments like that are what make life worth living." The video, which premieres on Thursday, is "quite abstract," says Lucy, "because it's telling one part of this huge story of how we ended up here. "I wanted the scenery and Zoe's words to do the talking." Image caption The walk down to the causeway "is really steep," says Lucy, but "Zoe did her research and looked at disabled access. She was amazing." It's an affecting and emotional watch, especially when you know the back story. But for Lucy, just making the video was reward enough. "I was just so relieved and happy that Zoe had a great time - because it was a huge ask for someone in her situation to put her body through what we put her body through. And the repercussions of the whole trip was going to mean a week in bed, pretty much. "It was just like a combination of euphoria that it happened, and pure happiness that she'd enjoyed it."